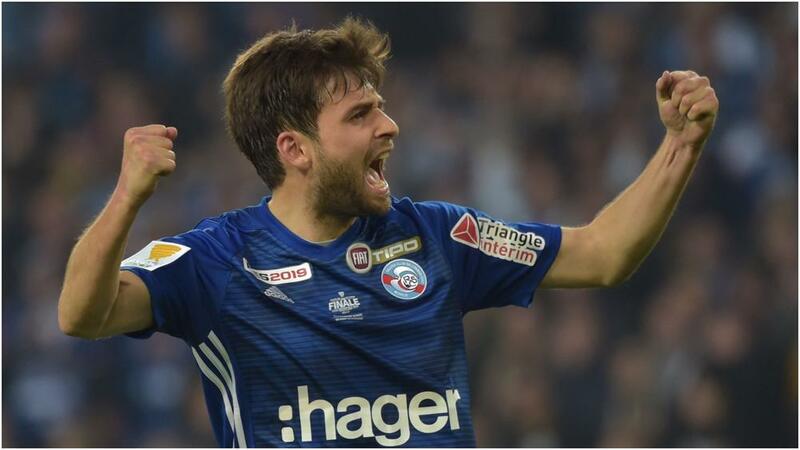 Strasbourg's fairytale rise back to the top level of French football reached a high point on Saturday as they clinched Coupe de la Ligue glory with a 4-1 penalty shoot-out win over Guingamp. And, in contest low on attacking inspiration it was they and not Guingamp - previously the last team other than Paris Saint-Germain to win a French Cup competition - who held their nerve in the shoot-out after extra time finished with the score goalless. Thierry Laurey's Strasbourg converted all four of their penalties while Alexandre Mendy and Ronny Rodelin failed to score for Guingamp - the former firing over the bar and the latter seeing his effort saved - as the Alsace club ended a 14-year wait for their fourth Coupe de la Ligue triumph. Kamara was called into action again in the 55th minute as he got down low to his left to keep out Nicolas Benezet's drive, while at the other end Adrien Thomasson spurned a gilt-edged chance by turning wide from Ibrahima Sissoko's clever pull back. Substitute Mendy frayed Strasbourg nerves late in the second period of extra time but Kamara was equal to his near-post effort, sending the contest to a shoot-out in which Lionel Carole's penalty sealed the trophy for Laurey's men.